Tom was licensed in 1960 as KN4TSJ and soon thereafter was working DX as K4TSJ. Current achievements are DXCC with 365 countries, Top of the Honor Roll; Honor Roll on Mixed, SSB and CW and 9 Band DXCC. He has also obtained 5BWAZ and WPX on Mixed, SSB and CW. In 2007 Tom was honored at Dayton by CQ Magazine by being inducted into the CQ DX Hall of Fame. K4M - Midway Atoll, & Wake Island - AL7EL/KH9. 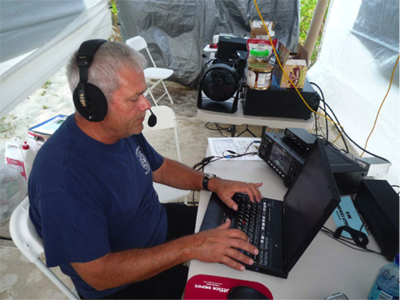 Tom has led DXpeditions as Team Leader or Team Co-Leader to K5K - Kingman Reef, Wake Island - AL7EL/KH9, KH9/AL7EL & K8XP/KH9, & North Cook - ZK1XXP. He has operated from Palmyra Atoll - N4XP/KH5, 9M600 - Spratly Island, 9M6AAC, BV4FH, T32O, N4XP/V7, V73XP, AL7EL/V7, YV, HR, HP, DL, SM, ON, OK, G, GW, GD5BBG and N4XP/GD. Tom also operated from KL7 for two years as AL7EL while on work assignment for the US Army. Current or past calls held are K4TSJ, W8FCI, AL7EL, K8XP, OK8XP, V73XP, ON9CXP, and N4XP/SM. He is a member of the Dateline DX Association, Southeastern DX Club, Northern California DX Foundation, INDEXA, and The OK DX Foundation (OK). Tom is retired from the Federal Fire Service as a Senior Fire Officer with thirty six years service. He now owns and operates S. Thomas Harrell & Associates, LLC providing consulting services in fire protection and prevention worldwide.